The Ursa Major is popularly known as the Big Dipper. The Big Dipper is the most prominent constellation in the night sky, and one can look at this very large constellation throughout the entire year. In technical language, it is called "circumpolar". 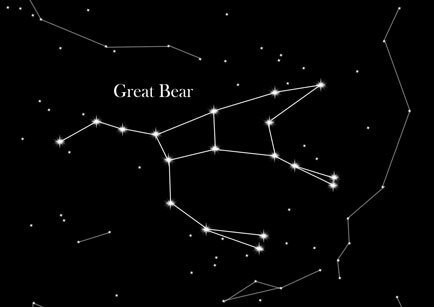 The Great Bear (Ursa Major is a Latin term which means "major bear") is a constellation of the northern sky and a very ancient constellation, which has already been known to the ancient Egyptians. Ursa Major has been mentioned by many famous poets such as Shakespeare, Tennyson and Homer. The Great Bear consists of a very large number of stars. The seven brightest stars of the constellation form a figure similar to that of a wagon. The entire constellation however looks like a bear, and consequently, the constellation is referred to by the general public as the Big Dipper. The "Wagon" is not a constellation itself, but an asterism, a very characteristic pattern in the sky, which itself is not considered a constellation. Ursa Major consists of many bright galaxies in the sky, including the pair Messier 81 (which is one of the brightest galaxies in the sky) and Messier 82. The mythology behind the constellation of Ursa Major is quite a tragedy. In Greek mythology, Zeus fell in love with a young woman named Callisto. They had a son named Arcas. Filled with jealousy, Hera, Zeus’s wife, transformed the beautiful woman into a bear. Later on, Callisto, while still in the form of a bear, encountered her own son Arcas. Arcas didn’t realize it was his mother and even tried to shoot the bear. To save Callisto, Zeus turned them both into bears and put in the sky, forming the Ursa Major.